Described is a display sub-system, designed for support of a very high speed rendering engine. It provides high-performance graphics to an environment that consists of a hierarchy of resizable windows. The concept of virtual memory has been applied with the organization of the virtual to physical address spaces having a unique mapping that fits the organization of a bit-mapped graphics memory display. 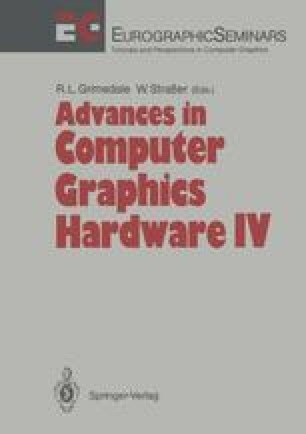 CR Categories and Subject Descriptors: I.3.1 [Computer Graphics]: Hardware Architectures — raster display devices; 1.3.3 [Computer Graphics]: Picture/Image Generation — display algorithms.